There&apos;s no denying it: baseball&apos;s TV ratings are going down the tubes. Once dubbed as America&apos;s past time, the sport is rooted in this country&apos;s culture more than anything, but steroid scandals and an often painfully-slow game pace have turned fans off of baseball in recent years. That&apos;s not to say people still don&apos;t huddle around the TV for a good ol&apos; fashioned ballgame. Despite its waning popularity, baseball still draws in flocks of distinct fans. Here are the five types of people who still watch these days. Yeah, every anecdote will begin with "back in my day." And yeah, every half-inning features a bathroom break. But make no mistake about it, watching baseball with elderly fans is a good time. Baseball was America&apos;s prime-time sport up until a decade or two ago, and as a tool of assimilation for early 20th century immigrants, the sport holds a special connotation with older crowds. Ask your grandmother or grandfather about the days of Mantle and DiMaggio, or get an earful about how bleacher seats used to cost just a buck. Sadly, many of these elderly fans are relegated to watching the Marlins or Rays, with Florida being a hotspot for retirees. Of course, right as baseball becomes unpopular, hip 20-somethings are looking to take it back. Unlike football, which rewards brute strength, and basketball, which is dominated by flashy superstar play, success in baseball is pretty eclectic. Hipsters can certainly get behind a scrawny, speedy outfielder more than a 300-pound offensive guard. And nearly every MLB team touts a moustached player or two. 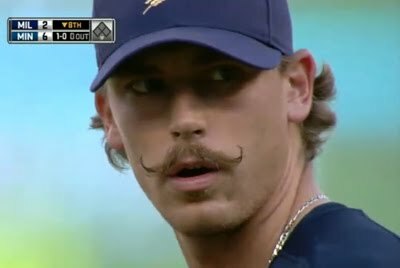 Milwaukee&apos;s John Axford is about as hip as it gets in professional sports. Football has 16 games per season. Basketball and hockey each play 82. Baseball? Try 162. With each player getting at least four at-bats per game, there are more head-to-head matchups and random statistical intricacies than you can imagine in the Major Leagues. Statheads and sports junkies love baseball because there&apos;s such a trend to it. Unlike other major sports, where it seems like unpredictability is king and upset games run wild, baseball is the easiest to predict and has the most reason to it. Moneyball-type fans and analysts are all over the place, and they can&apos;t get enough of baseball. Everything south of the Mason-Dixon is still known as baseball country. With warm weather and wholesome attitudes, Southerners love a good summer ballgame. Fans of the Texas Rangers and Atlanta Braves continue to rank among the league&apos;s most passionate and rowdy bunches. There&apos;s nothing like capping a sweltering summer day with a beer or two by the TV. And because many southern states lack a professional team, broadcast markets constantly overlap, giving fans down there plenty of opportunities to tune in to a game. Throw away your Sunday traditions or your posters of NBA superstars. Baseball might not have the most viewership anymore, but its fans still cling to century-long traditions and tout levels of loyalty that are unheard of in any other sport. Because baseball&apos;s been around for so long, teams have become engrained in the culture and history of cities. Boston lives and dies for its Red Sox; New York stops moving for a second to catch the Yankees. There&apos;s still plenty of fans who stay glued to the TV for all 162 games. Every team has its fans of Fever Pitch intensity. Even as the game continues to change and the markets start to dwindle, the die-hards will always be around.